The common QR scanning experience is to link directly to a landing page (i.e., website). Phy is a robust platform that offers a superior alternative to a traditional landing page, whether it be DIY or platform-built. When a Phy-managed QR code is scanned, the experience is like local search. Instead of a blind link to a website, the user sees a selection of informative previews (called “Actions”), each of which links to a corresponding website or action. Appropriately named, this “preview page” lets the user choose the Action that best serves their need. In effect, each Action links to its own landing page, which gives preview pages significant breadth and flexibility. While it is possible to build a landing page that resembles a Phy preview page, it is not easy to replicate its flexibility or many additional functions. Preview pages are familiar, modular, location-aware, contextual, and fast. It’s the use of an innovative three-stage CMS, and the control it affords over the user experience that makes preview pages so powerful. A traditional landing page is limited by the use of a single-stage CMS, which doesn’t integrate the customer as a part of the process. With the Phy CMS, there are three distinct stages of control over every interaction. ‍The Preview stage gives the marketer control over which Actions are available at a location (i.e., QR code), including when they are available the order they are presented. The Engagement stage transfers control to the end user to choose which of the Actions serves their need. The Fulfillment stage returns control to the marketer, where they control the Actions, including what metadata is displayed and what function is performed (e.g., redirect, microsite, SMS, webhook, etc.). By incorporating user input, a three-stage CMS better serves users while also capturing valuable intent data. Traditional landing pages simply deliver content, while a the Phy platform manages conversational experiences. Other benefits of Phy’s three-stage CMS are many and varied, so read on if you want to learn more. The platform’s CMS is purpose-built for mobile engagement. It produces user-experiences with a consistent, conversational cadence of 1) Preview, 2) Engage, and 3) Fulfill. People see a preview of their options and engage when they choose the action that fulfills their immediate need. People choose to scan QR codes or NFC tags because they have a need. This conversational cadence places control with the user and consistently puts the marketer in the positive light of listening and delivering meaningful experiences. The platform captures metrics for each modular element of its CMS. This means capturing overall metrics for a QR code and then for the relative click-throughs of the various actions available to that code. It also means measuring the overall performance of an Action that is deployed across multiple QR codes. Performance metrics on Actions also means that A/B testing can be replaced by simultaneously testing A, B, C, and D and learning immediately which action users want. Moreover, by measuring user input, the platform is capturing expressed intent. Traditional landing pages capture only QR scans, while the Phy platform records scans, impressions (that an Action was displayed), and taps (that a user chose an Action). Often, marketers check what type device customers use. Yes, this is somewhat useful, but the Phy platform goes much deeper, letting them know their customer’s interest as well as their intent when a product is in hand. By capturing intent through a closed feedback loop, the Phy platform captures vital information not otherwise available from web analytics. According to Google research, the load time of the average mobile landing page is 22 seconds, while users begin leaving after only a few seconds. Because preview pages are built entirely with lightweight metadata, they consistently load with lightning speed. The Phy platform is location-aware and comes with the supporting management and measurement tools not normally available to landing pages. Preview pages use platform-issued IDs that are uniquely associated with QR codes. The same preview page can be shown simultaneously on hundreds or thousands of unique, location-specific QR codes. Each location thus has its metrics for every interaction. The platform will even automatically append the tracking ID of the originating location to a destination URL as a query variable. As a proximity platform, Phy also allows images and notes to be associated with a location ID. When planning content for QR codes on products in locations all over the world, it is valuable to visually see an image of the codes in their deployed locations. Preview pages are made of standardized, modular elements called Actions. Because preview pages are not created until a QR code is scanned, their associated Actions may be controlled by rule, schedule, or API. Actions are stored in a reusable library. They can be applied as needed, to one QR code or thousands in bulk. Actions can be added, removed, or scheduled as needed, and can be easily edited to create alternate versions. One example of the power of modular elements is when an action is incorporated into hundreds of different preview pages, whereupon changes to that action will automatically update all associated preview pages. Once actions are incorporated into a preview page, they can be monitored for effectiveness and rearranged, altered, or substituted as needed. Unlike a common landing page, if you want to schedule an exclusive promotion for fifteen minutes on Thursday at noon, it’s as easy as scheduling a single action. It’s just as simple to add as needed an action from a sponsor, post a recall notice, or add a big announcement to a preview page. Scanning QR codes is a form of local search. The Phy platform’s modular, interchangeable elements make it easy for marketers to curate and manage these search results. One landing page is not enough to serve the varied needs of a diverse customer base that are often in different stages of the customer cycle. Preview pages are just that... previews of available actions. Each Action can link to an external URL or to an individual landing page built and hosted on the Phy platform. If, for example, you need English, Spanish, and French versions of the same content, then the Phy platform enables all three as options. At the same time, it is easy to add landing pages that simultaneously target users wanting to gather more information, users ready to buy now, and users in search of support. Action elements are based on industry-standard metadata, which makes building them a snap. When a destination URL is chosen, the Phy platform will automatically create an Action from existing metadata. Administrators then have the option of editing the metadata to tweak the message. Another benefit of using standard metadata is that the resulting previews are instantly familiar. People use search engines daily, so they’re programmed to quickly review and choose from links previewed with standard metadata. As a result, preview pages are always uniform, visually pleasing, and quickly interpreted, without any design effort at all. Integrated context management tools let you assign, manage and interpret contextual elements such as location, timestamps, campaign, or product details. Any or all of these can be automatically transferred to action-embedded URLs as query variables for downstream use. The Phy platform offers a growing list of actions apart from the standard link to a URL. These include “make a call,” “send an SMS,” or “send an email.” There’s even a platform-managed action to execute a webhook that can do most anything, including interact with a nearby IoT device. 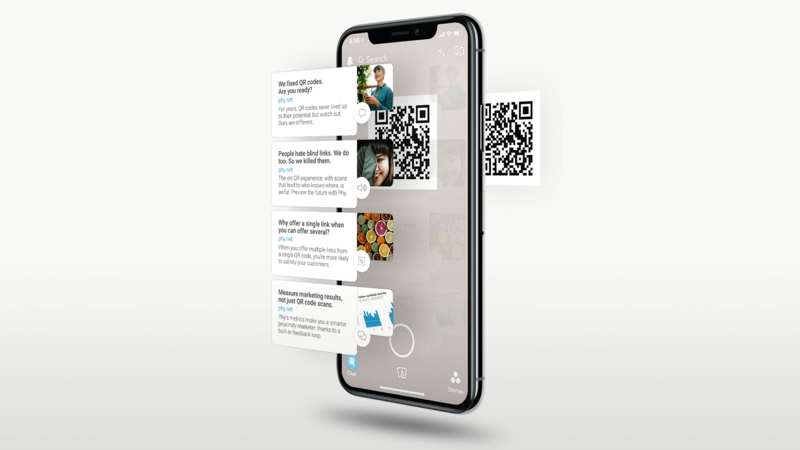 When using the unique identifier that is automatically assigned by our SDK, the Phy platform also opens the door to personalized QR experiences. The Phy platform is built for enterprise-scale deployments, with full customer support and more robust features in the works. Additionally, it extends beyond QR codes to NFC tags and Bluetooth® beacons, with an intuitive, user-friendly interface that makes it easy to bring in additional marketing team members to help create, update, schedule, and measure content. So what’s the difference between Phy and other QR or NFC platforms? About Phy; A little history of how we got here. Phy: The Physical channel of digital marketing.